“[There are] ways that we often talk about love of place, by which we mean our love for places, but seldom of how the places love us back, of what they give us. They give us continuity, something to return to, and offer a familiarity that allows some portion of our lives to remain connected and coherent." When you've lived in a place long enough, you know it like a family member. It’s strengths and weakness are plain. Here is the corner where homelessness, drunkenness and sadness abounds. Where you were accosted by a stranger on your first visit to the town eight or more years ago. Here is the corner where drivers do not watch for cyclists, and you were almost struck on your way to work. And here is the sweet bakery whose employees you know by name, the corner where you pick up your farm share, the hardware store where the people are kind and where they sell screwdrivers alongside fragile plants. More than anything else, you come to know the tastes of the place -- what the French call terroir. Things you have never tried before or you couldn't buy anywhere else: dukkah, Downeast cider, Dwelltime coffee beans. After five years in Cambridge, there are many things I will miss when I leave. Foods are the easiest loss to anticipate. There is the pepperjack sesame cheese bread from Nashoba Brook Bakery we got hooked on in a spring farm share two years ago and have only just (just!) managed to secure in regular supply. The green goddess bowl at Life Alive, where the annoyingly long wait can be circumvented by a quick phone call, allowing you to jump the line. And the hazelnut chocolate cookies at Flour bakery, which I never grow tired of, but are recently unavailable due to skyrocketing nut prices. And there is the sandwich at Central Bottle, a wine store that also sells food, which I've lived off of for stretches of time. Before this sandwich, I couldn't stand arugula. I had a nearly allergic reaction to it's sharp taste on my tongue. But after this sandwich, I could tolerate the bitter green. Even grew to enjoy it, silently renaming it rocket in my mind, and together we were off to the races. The sandwich in question is rather simple. It is goat cheese meets lemon zest, sage, olive oil and walnuts laid out on a thin baguette, with a bed of greens layered on top. And that's it. Simple but spectacular in its execution. Of course, I discovered last week that they do not even make this sandwich anymore. There it is — life. Either you change or the world changes around you. Best to take what you can, and just keep marching. My favorite walnut cookies from the coffeeshop disappeared two years ago. After a change in the baker, they'd failed to reappear. Lamenting their loss, I squeezed the recipe out of the lady behind the bar. A few months later, I came in with a fresh baked batch to share, and the women who sold me these cookies for years, reveled in their memory. The cookies were no longer theirs — now they were mine. It was now up to me to carry the recipe on. And it in turn would function as a map, directing me back to a time and place when I was a student who hung out in a coffee shop in Cambridge and got to know the baristas by name. And then there are all the places I've neglected in my time here. The deli in Harvard Square. Haymarket — a razzle-dazzle wholesale market in Boston I haven't ventured to in more than four years. A ramen shop in Porter square I've never tried, but my friend swears by. One could live a life time in this city and never explore all its crevices, not least because we creatures of habit are often loathe to venture into the unknown. But into the unknown I will soon go! Our new home, Santa Barbara, will have its own culinary highlights. In our short visits, we've already fallen in love with the lemon bread from Crazy Good Bread Co. And the Thai food at TAP Thai. And I'm already missing a brand of greek yogurt I bought there, that I've confirmed one cannot source in the northeast. Portions listed for one sandwich - double or triple for more! 1. Cut the bread in half. Lightly toast if you like, but not necessary. 2. Put a 1-3 tablespoons of goat cheese in a small bowl. Add about a 1/4 of a lemon of zest per sandwich and 1-4 sage leaves, per your taste for the herb. Add some olive oil, maybe around a 1/2 tablespoon. Finely chop a tiny handful of walnuts and add to the bowl. Mix it all up. 3. Spread the mixture onto both sides of your baguette. Add the arugula in the middle and squash it all together a bit. You're ready to eat! Add some olives to a small pan and add some olive oil to cover the bottom of the pan about a 1/4 inch. Put some citrus peels or zest in -- I like a mix of lemon and orange peels. Cook over low heat for a few minutes until warmed, move the olives around periodically so they don't overcook in one spot. If you don't eat all the olives the citrus flavor will increase over time in the olive oil. And you can eat the olive oil later, for example by dipping bread into it or using it to cook something else. Posted in lunch, snacks, spring and tagged with lemon, walnuts, sandwich. May 5, 2015 by Leah. Where have I been these long months? It would be accurate to say I was busy, off on research. After a long day of interviews, without a kitchen to cook in, more apt to eat out than in. And that would be true enough. But, I have a dark secret. Something else has been keeping me away from creative pursuits in the garden, kitchen, and online. A quick fix, a simple pleasure: gardening phone games. I managed to avoid the Farmville bonanza that took many a Facebook friend by storm a few years ago. The addiction I saw broadcast in my news feed warned me against trying my luck in the digital fields. But this past December, after becoming attached to my phone for a solid week because of a boulder game (in hindsight, it wasn’t that fun), I was in the market for another game. When a gardening game put on a holiday theme, it was promoted in the app store, and before long, I was hooked. And there went the last 4 months of my life. I exaggerate, of course. I largely haven’t played the game since early February, when I practically beat it. And in my defense, there were no gardens for me to tend in the winter or on the road. Cooking out of other people’s apartments proved difficult. So I’ll forgive myself for my transgressions into digital farming. The addiction is quite simple to understand. It’s the quick turnaround that really hooks you: the dream that plants could grow in mere instants, before you eye. A glorious, conceit. In practice, seeds can take weeks to sprout, particularly on a cool windowsill in early April. 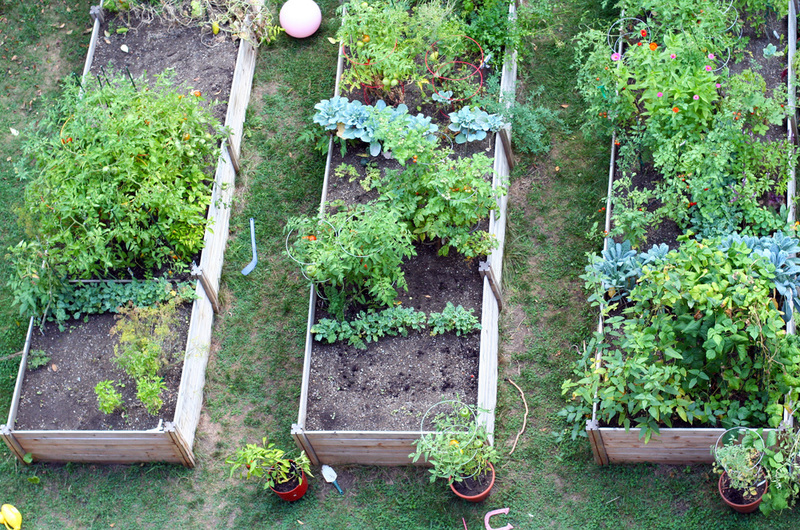 Once planted, gardens unfold over months from light green to ripe fruit. Still, the pleasure there is greater from the waiting. The only thing that seems to grow almost as quickly as a digital plant, transforming before your very eyes, are pea shoots. A few days of water shock, an inch or two of soil, some sunlight -- even diffuse: that’ll do it in about a week. A lot of the magic happens beneath the soil, as the seeds push thick, white roots every which way at an incredible speed. I forgot to take a picture, but if you try some sprouts, take my advice and plant them in a glass jar so you can see their hidden progress underneath. But since we’ve been back, with spring peeking in day by day, the thing I most want to eat doesn’t require much fussing at all. It’s simple, with a rotating cast of ingredients, and just a bowl and fork needed for mixing: mashed peas with ricotta on toast. Where this idea came from, I can't surely tell you. It's one part seasonal obsession, another part simplicity. It was also the best meal I ate last June in France. A humble offering of bread, peas, ricotta and a few choice herbs -- served as a main in a restaurant in Grenoble. Brilliant. That, and Pollan's Cooked has me obsessed with toasting things. I have always adored toast, but a passage in the book told me why. It turns out when you heat things up at a high temperature, the proteins and amino acids bend and break into thousands of other molecules. This is why caramelized things taste so delicious: they're complex and unique. Toast is surely the fastest route to such a trick. So with fresh pea shoots at hand, and a lack of familiarity in my own kitchen, I've been eating a lot of peas on toast. I’ve had it three times since being back, each time a little different than the last. It's simple fare that can be dressed up or down or even sideways, depending on what's in your pantry or fridge, or even sprouting on your windowsill. And it's a lot more satisfying to grow yourself some sprouts and eat them, than playing a silly phone game. I'll take an obsession with toast over an obsession with pixelated bread on a screen. With spring coming, it's time for me to get back to gardening -- for real this time. A bunch of peas, shelled. Ideally fresh, but can be frozen too. 2. Boil your peas to cook, but only briefly, until they're a little brighter and have softened. Fresh likely need 5 minutes or less. If you're using frozen, they need just a couple minutes. 3. Drain the peas and cool them down under some running water. Tamar Adler would tell you to save that cooking liquid for your impending stock. So, you could do that. Or you could just strain the peas. 4. If you're using leeks, sauté them in some butter or olive oil. Butter is surely more delicious. You want them to be browned. Also, you can use the green tops of leeks - my American friends seem to think you can't, but I assure you, you can. They're like the green tops of scallions. Just cook them longer if you're worried that they're tough. 5. Zest your lemon, chop up your herbs of choice -- roughly, grate your parmesan. You can put all this on top of your peas. Mash the peas with a fork or if you are blessed enough to have one, a potato smasher. The idea is to smash the peas a bit, but don't overdo it: use your good judgement. Add the ricotta, as much as you like, and some olive oil. Taste liberally! Add the salt and pepper. Add those leeks if you're using them. Squeeze in your lemon squeezes and taste some more. Adjust accordingly. If you want to go dairy free, then do that! This is delicious with or without the cheese. 6. Now you have a big delicious bowl of the stuff. Put it on top of the toast and garnish however you like. I put some sprouts, some salt or some parmesan on top. Eat! Leftovers work as a side if you've run out of toast. Posted in dinner, snacks, spring and tagged with peas, sprouts, ricotta. April 23, 2014 by Leah. Some night this week, the first frost will set in and the growing season will be over. The garden had a lot of successes this year. From a small container, I produced 4 sugar baby watermelons. Never mind that a squirrel got one of them, or that another never grew past the size of a pool ball. For Zone 6, I'd call any watermelon a success. The last one was still out there in early October, growing away, six inches across. The dinosaur kale came in thick and dark green. We grew lots of tomatoes, in all shapes and sizes, even in a year where tomatoes were slow going. And the carrots are still coming up, thickening away under the soil. But the biggest success this year goes, hands down, to the asparagus beans. When I first sowed the seeds back in April, I thought of them as an experiment. I'd bought them at the hardware store on a whim, not from a fancy seed catalogue. When the shoots started to twist and climb, their leaves were nothing remarkable; quite thin compared to the other pole beans I'd planted. And their flowers, arriving in June, barely resembled flowers at all. Then I spotted some ants on the ends of the long, stick like buds. With each return to the plants, I would find those ants again, crawling just around the flowers. If you look closely in the photo above, you can see an ant nestled between the two flower buds on the right. I became suspicious that these plants were ant pollinated, and indeed they are. The plants must put out attractors that invite the ants to come visit their flowers. 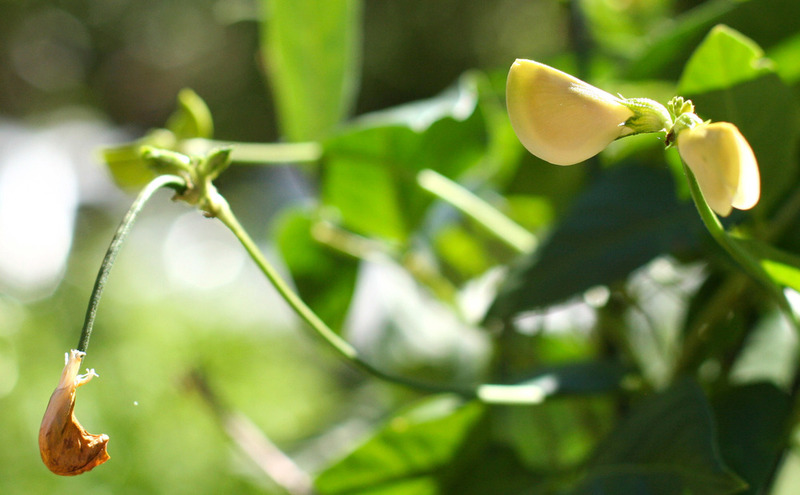 Once the flowers are pollinated, the thin beans begin to form at the tip of the bud, pushing the dried-up flowers outward, as seen on the left part of the photo above. But the beans weren't just attracting the pollinators: they were also drawing in curious neighbors. When we got our first crop in early July, we were out of town. The beans grow fast, thickening and lengthening with each passing day. When full length, they look like garlic scapes, or more imaginatively, garter snakes. No one could make heads or tails of these strange vegetables we were growing. My neighbor took a photo of his baby next to the bean, and showed it to me when we got back: the bean was longer than the baby. The beans became a conversation piece with my neighbors. Apart from the beans, getting to know our neighbors has been the highlight of the garden this year. I've gotten to know the kids living in the building next door -- their personalities, likes and dislikes. We've been invited to kids' birthday parties, including one themed "ballerinas and drummers" and another themed "medieval times." The hockey stick, duck-shaped watering can and big pink ball littered around the raised beds are all artifacts of the childrens' time spent in the garden. The kids would often want to help me harvest my bounty, particularly the funny shaped asparagus beans. A full batch would find us picking around two dozen beans, alongside a handful of ripe cherry tomatoes. The kids were always disappointed when the picking came to an end. "Are you sure you don't need me to help you harvest anything else?" the six-year-old girl downstairs would implore. But the end did come -- no more beans to harvest that day, and soon, no more garden for six months to come. We'll just have to start again next year. Asparagus beans are already on my list. Cut the asparagus beans into 1-inch long pieces. Heat up the oil under medium-high heat, ideally in a wok, and add the red pepper flakes. Add the shallots and cook for a few minutes, until beginning to brown. Add the ginger and garlic, cook for 1 minute. Add the beans and cook for a few minutes until starting to brown and soften. Add the vegetable stock, and keep tossing the beans until most of the liquid has evaporated. Add the honey, sesame oil, salt and pepper and toss to coat. At the last minute, add the sesame seeds, and serve on rice. Posted in dinner, snacks, gardening and tagged with beans, sesame, rice, ginger. October 23, 2013 by Leah. The garden did a lot of growing up in my absence. The beans shot five feet high, well beyond their bamboo supports. The tomatoes nearly doubled in size, and began to bear fruit. We have one tiny watermelon, hidden beneath the vines. And although I can't see them, I know the carrots are busy digging their way down down , clad in crimson red, golden yellow and even the standard orange. The kale has done well, and managed to grow despite persistent holes. The worst of the caterpillars was over before we shipped out a month ago. With this heat, I imagine they've all gone to bed for a while, before transforming into beautiful flying creatures. My neighbors' plots are similarly bountiful. Since everyone chose different varietals, the garden is a study in diversity. There are tomatoes that grow like a bush, down near the ground, and produce dozens upon dozens of orange and red fruit. Others have shot up four feet high, reaching for the sunlight in a shadier spot. Since we mostly planted heirloom varietals, and started many from seed, our tomatoes are less productive than our neighbors' crops. Still, the early ones are "sweet like sugar" to borrow a phrase from Michael Pollan's grandfather. I'll trade quantity for quality this time. A few months ago, when everyone got going, one of my neighbors with two small kids planted clear, straight rows of two greens: kale and beets. She just took a whole packet of seed and laid it out like a farmer would. Only later did she study the package and discover it was made to plant a row 100 feet long. Her row stretched a full four feet. Given the compost she wisely mixed into the soil, it wasn't long before the seeds were spouting and competing with one another for space, nutrients and light. Something had to be done about these cramped quarters. Her first line of attack was to eat the greens. She harvested as much young kale as she could and made salads. Before long her kids were loving raw kale. This tactic thinned the plants somewhat. And, overall, her plants were doing fine under the conditions. Still, nosy neighbor that I am, I couldn't help giving advice. I mentioned she might want to thin the seedlings out a bit, and maybe try transplanting a few. We have one spot in the garden set aside as a communal plot. The idea was to plant herbs that people could share, and to create a space that anyone could enjoy. In practice, it's a bit overrun. There is a borage plant larger than any borage plant ought to be. The basil is shaded and the tarragon looks sad. But still, it's what my friend would deem "bricolage" -- a small work of clumsy, communal art, made by a motley crew of garden painters with only the best of intentions. In its own way, it's beautiful. After my neighbor had eaten as much kale as she could manage, and after I'd weighed in, she transplanted a row of kale from her plot to the communal plot. This pleased me immensely, as I can eat through kale in no time flat, simply making it into delicious chips. "I moved some radishes over," she announced to me. "They're in the shared plot." I looked at her confused, then went to investigate the plants one more time. Those were not radishes. They were kale. I summoned up the courage to once again poke my nose in it, and told her she might be mistaken. It turns out she'd been feeding her kids radish greens for months, not kale. Her husband thought this was hilarious. Well, radish tops are still edible! Today, her two kids were running around the garden, staring into their now thinned out plot. The three year old girl who rarely talks pointed to each plant in turn, announcing its name to no one. "Tomato." "Cucumbers." "Kale." She must have practiced with her mother. At that age, she already knew more about what plants looked like than her mom did as an adult. Meanwhile, her five year old brother was standing over the plot, picking raw kale, and happily eating it. All those months trained on radish leaves must have made kale seem like a cake walk. Raw kale. Bitter greens. I wouldn't eat it straight out of the garden! "You know, it tastes better cooked," I told him, again refusing to mind my own business. "Has your mom ever made you kale chips before?" He stared back at me. "No. I like it this way. It taste good raw!" I was dumbstruck. I harvested some small curly kale from the communal plot, and added some tuscan kale of my own. I ran upstairs and mixed the few ingredients together: olive oil, sesame oil, soy sauce. Into the toaster oven they went at 325 degrees. It was a short wait before they were crisp. Then, back down the stairs I bounded, with my bounty in tow to share. I tried to entice the kids into trying one. They were chips, after all. Who wouldn't get excited? But no, they insisted. They were happy just eating it raw out of the garden, thank you very much. Well, more for me. On my way back upstairs the boy went running past me, yelling, "I just need to go eat some more raw kale from the garden!" I prefer these chips to the standard olive oil + salt fare. I also turn up the oven a bit hotter, which gets them done faster. This is key in hot weather. If you have one, use your toaster oven. You can even stack two trays, like I do, which cuts down on the heat and energy necessary. If you do take this toaster-oven-stacking-route, add an extra minute or two. Preheat (toaster) oven to 325F. Wash and dry full pieces of kale (half a bunch or so). A salad spinner is useful, as is a cloth. Lay out the kale on a baking sheet or two. Mix: 1 tablespoon olive oil; 1 teaspoon (toasted) sesame oil; 1/4 to 1/2 teaspoon of soy sauce (or nama shoyu, if you're fancy like that). The more soy, the more salt. I prefer not to add any salt or it gets a bit out of hand. Dip a piece of kale into the oil and drizzle onto its compatriots. I like to distribute the oil this way, and then massage it into the leaves. It's fun to watch the leaves darken, the texture is lovely and this overwrought approach distributes the oil more evenly. You can also pour the oil onto the leaves delicately, or just mix it all in a bowl. Lay the kale out relatively flat on a baking sheet and bake for 8-10 minutes, until dry and crisp. They last approximately 5 minutes -- the time it takes to eat them. You will always wish you made a double or triple batch. Trust me. Posted in gardening, snacks and tagged with kale, sesame. July 15, 2013 by Leah.